This is a 2200 square foot cabin not including the main and second level decks. With 1 king bed and 1 queen hide-a-bed on the main level, 1 queen bed and hide-a-bed, and a full bed on the lower level, there is plenty of room for 10 to sleep comfortably. “Mayberry’s” spacious layout spanning three levels with luxury accommodations for up to 10 people. 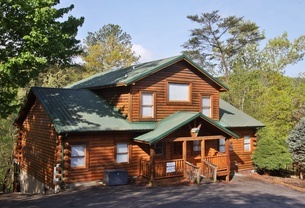 You may have never heard of Jimmy Gilmer and the Fireballs or their hit song “Sugar Shack ” but once you visit this gem of a Smoky Mountain vacation rental cabin you won’t ever forget it. Get in touch with nature and escape the stress of everyday life at this beautiful cabin. If you are looking to have some relaxation time without being disturbed, then Secluded Escape is the one for you. 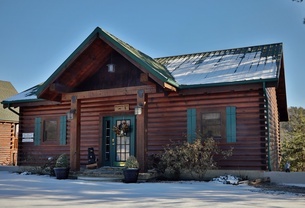 Look no farther than “Big Pine Lodge ” for your luxurious log rental vacation cabin! This handicap accessible cabin has great amenities for the ultimate vacation and can accommodate up to 22 people all in one cabin! 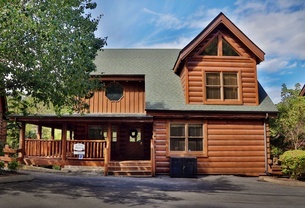 Moonlight and Memories is the ideal location for a Smoky Mountain getaway in Bear Creek Crossing Resort. This two-bedroom two-bathroom cabin has everything you are looking for in a relaxing vacation. 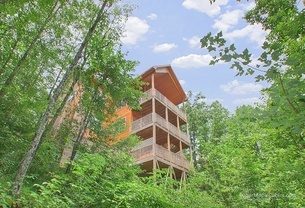 Spectacular mountain cabin located minutes from the Great Smokey Mountains National Park. Nestled on a mountain side the views from 3 spacious decks are spectacular.